This video really does offer a window into the high life! 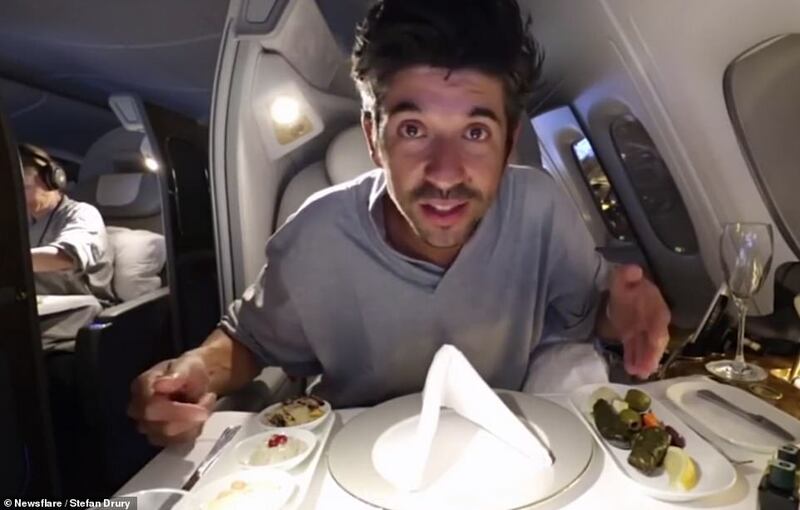 Private pilot and vlogger Stefan Drury filmed himself after being upgraded to first class on a Emirates A380 flight from Singapore to Australia, with the journey totalling seven hours and 25 minutes. 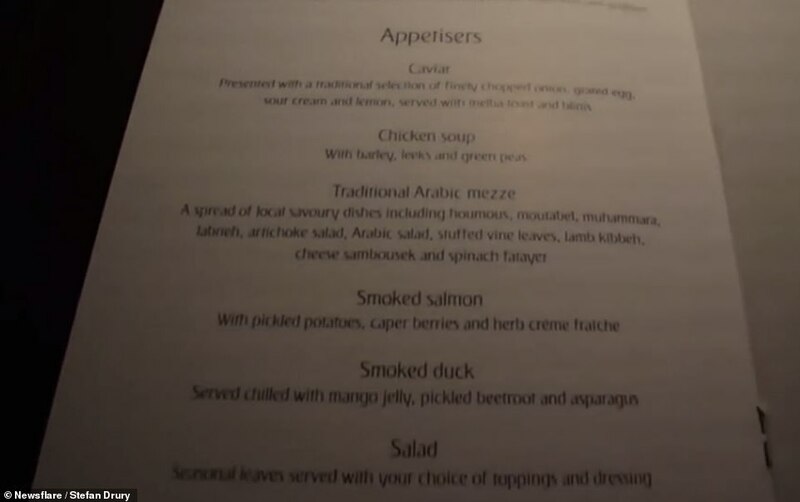 During his video, the frequent flyer reveals how there is caviar listed as an appetiser on the food menu and a large spa-like shower, which he proceeds to lather up in. The shower room, which is a lavish feature on Emirates first class, is seen with a toilet and sink area, complete with a large illuminated mirror. At the press of a button, Stefan turns the shower on. It appears to have a good amount of pressure as he washes and rinses away. 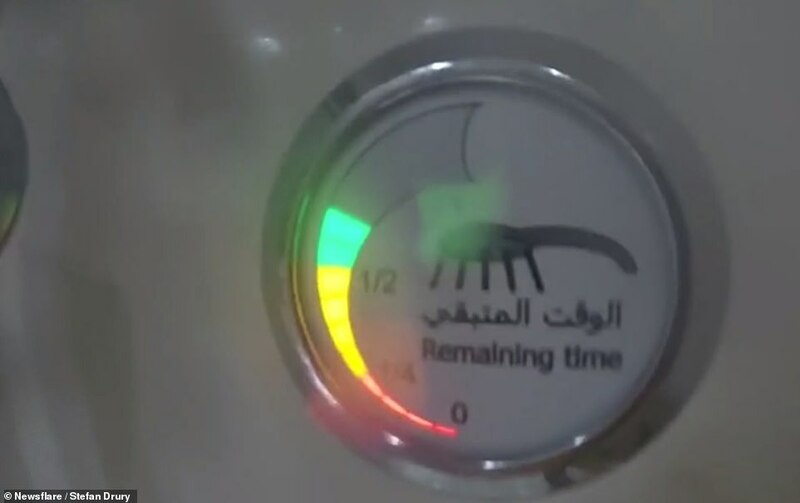 Along with the on-off button, there is another light up display indicating how much time is left. 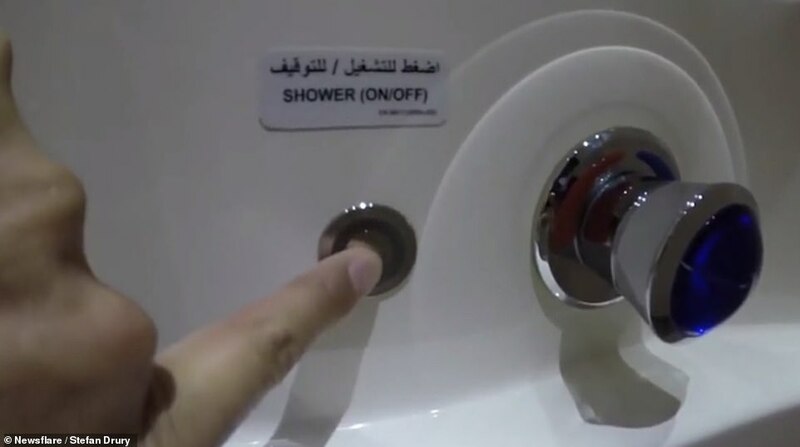 In the Emirates first class shower, you can spend 30 minutes using the room but there is only five minutes’ worth of hot water. There are two showers to serve 14 passengers. Stefan’s video reveals that there are various luxury touches in the washroom, including fresh orchids in the shower, an array of toiletries and fluffy towels to dry off with. 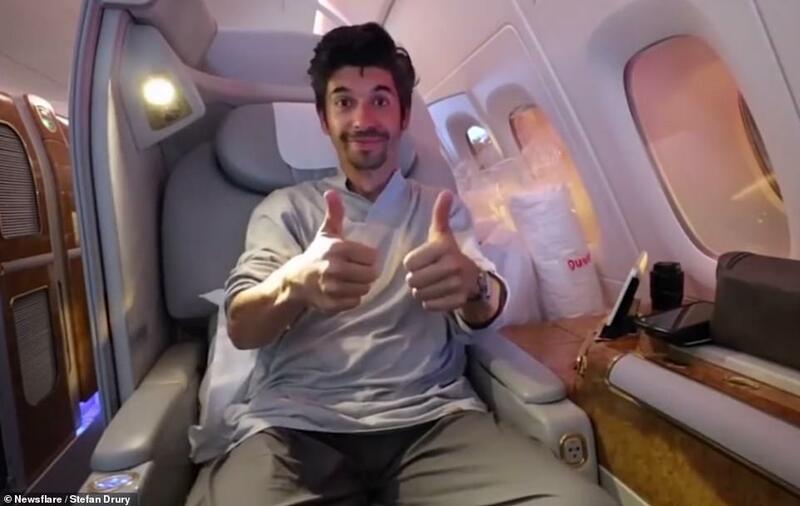 Stefan reveals in his video that other perks of flying first class with Emirates is the amenities bag, which he says is the biggest he has ever seen on an aircraft. ‘It’s like an amenities tote bag,’ he explains, while pulling out a pouch of bathroom products, slippers and pyjamas. After a swift change into his sleepwear, Stefan peruses the Emirates first class food menu, which he describes as being ‘pretty comprehensive’. 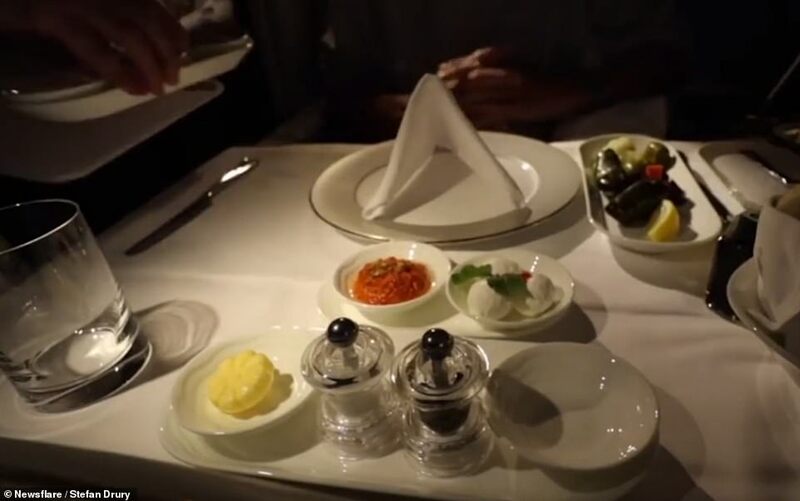 He swivels the camera around to show some of the items on offer, with the list of appetisers including caviar, chicken soup, smoked salmon, smoked duck and a traditional Arabic mezze. For main course, the options range from coconut braised beef short ribs to succulent grilled tiger prawns. Stefan notes that all of food is a la carte and can be ordered at any time. Tables are laid with silverware, linens and condiments. After wining and dining, Stefan settles down for a nap. He explains that he tried making his own bed ‘but obviously failed’ so one of the flight attendants helped him. 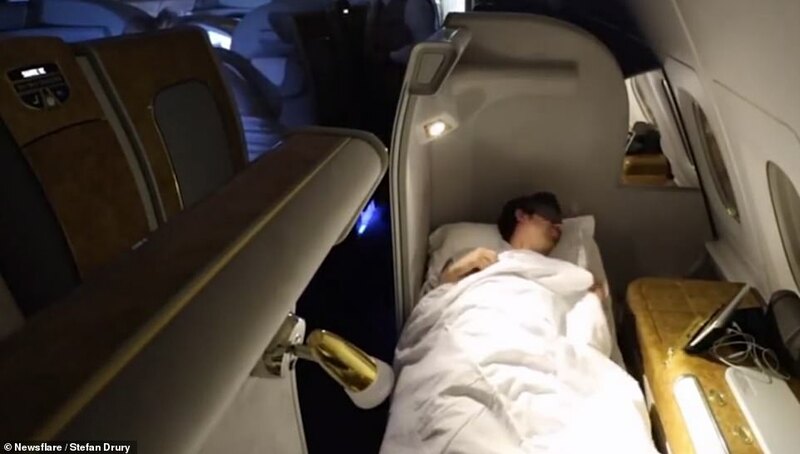 But he didn’t sleep for long, as he woke up after three hours in preparation for something ‘he’s wanted to do for so long’ – showering at 37,000 feet.